We’re fortunate to have so many people who are engaged in our mission to Keep Virginia Beautiful. If you take a look around this website you’ll see people posting updates on projects and a spin around our Facebook shows a great deal of interest. A look at Upcoming Events says that our circle of friends, fans, and followers are genuinely interested in keeping our great state clean. 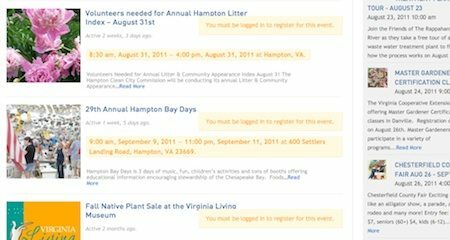 Many of the Events posted begin with the unfortunate tag “Volunteers Needed”. Look at our mission statement. “Whether you have five minutes or five hours.” That’s all it takes to Keep Virginia Beautiful. Many folks out there in the ether are using crowd sourcing to get their projects started. Sites like kickstarter use it to spur and fund innovation. The ASPCA is using it to give a $100,000 grant to the shelter that manages to adopt out the most animals. Mycharity:water is using it to provide clean drinking water to people all over the world. The EPA gets a lot of heat for missing the boat on many environmental issues but they are a great resource. Their website has news, ideas, and toolkits available for download to get your project started. You don’t have to be an inventor or social media guru to step up to the plate, though. Take a look at our Events list and pick something that’s convenient for you. Are you a member of a group? Boy Scouts, bridge club, school organization, neighborhood watch? You can organize your peers for a day of cleaning. Grab the little league and plant some flowers. Take the choir out for an afternoon of litter sweeping. Start with your own front yard. Online billing to reduce paper waste? Done. Energy efficient light bulbs? Got ‘em. Recycling as a way of life? Roger. The important part is to get involved. Today. Whether you spend five minutes or five hours. Just get out there and do it.